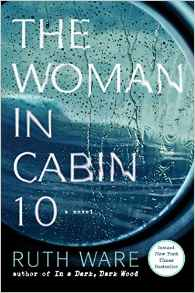 I know we are supposed to feel sorry for Lo Blacklock, the narrator of The Woman in Cabin 10. Soon after events in the story commence, she wakes up to find a burglar in her house. She is injured when he slams the door in her face, and becomes terrified that he will return. While this might be an explanation for her unstable behavior that follows, it doesn't explain why she is already on medication for panic attacks, why she constantly drinks too much, and why she is refusing to commit to her longtime boyfriend, Judah. Lo has worked for 10 years as a travel writer at Velocity magazine. Her boss, Rowan, gets all the choice assignments though. Lo thinks she's finally gotten her chance to move up the career ladder when Rowan goes on maternity leave and Lo is given the assignment to go on the maiden voyage of the luxury cruise ship the Aurora. The Aurora is sailing from England up to the fjords of Norway on an excursion to view the Northern Lights. There are only 10 cabins on the ship, and Lo is in cabin 9. On the first night of the cruise, Lo realizes that her mascara was in her purse that was taken during the recent break-in at her flat. She decides to see if her neighbor in cabin 10 might have some. When she knocks on the door, it is eventually answered by a young woman with long dark hair wearing a Pink Floyd t-shirt. She distractedly gives Lo the mascara and tells her to keep it. When Lo attends dinner that evening, she is introduced to her fellow passengers, but never sees the woman from Cabin 10. After dinner, Lo makes her way unsteadily back to her cabin after drinking too much (yet again). Not only is she affected by all the alcohol, but since the break-in, she's been unable to sleep. So it's with great weariness that she collapses into bed. While in a deep sleep, she suddenly is jerked from sleep. She's unable to tell why, but she has a vague memory of hearing a scream. As she listens, she hears the veranda door next door open, and then hears a large splash. She goes to her own veranda to look out, and sees a smear of blood on the dividing glass. She instantly picks up the phone to report what she's just seen, and a security officer is sent to speak to her. He tells her that cabin 10 is empty, and even takes her next door to see this for herself. Although she'd just had a glimpse into the room when the woman lent her the mascara, she'd seen a room in disarray. Now it's totally empty. They go and look out onto the veranda, and there's no blood on the dividing screen. Most people, especially those who had been drinking and were unsure of the circumstances, might have let it go. Not Lo. She insists on an investigation and continues to ask everyone if they've seen the woman from cabin 10. She continues to ask questions even when she's warned off by anonymous messages and when evidence of the woman's existence (the mascara and a photo) disappears. Interspersed with the events taking place as Lo investigates are emails from Judah and news reports that indicate that Lo is missing and hasn't been in contact with anyone since the boat left England. While the idea of the story is promising, Lo is such an unlikeable, annoying character that I was rooting for the unseen "bad guy" to catch up with her and put us all out of our misery. She is constantly complaining about how tired she is and how much her head aches, yet she seems to have plenty of energy to drink and pester everyone. The most annoying thing (out of many) about her is her inability to speak coherently to anyone. Whenever anyone speaks to her, she begins, "I . . ." and stops to think/reminisce/reconsider. SHE CAN NEVER SPEAK TO ANYONE NORMALLY! It's beyond maddening. It's hard to believe that anyone -- boss, co-workers, suspects, fellow passengers -- can take her seriously when she can't form a coherent sentence. I wish I had read the ebook because I would have liked to search for how many times she said, "I cursed myself for my stupidity." However many times it was, it surely wasn't as many times as I did.